To assess the effectiveness of small incision lenticule extraction (SMILE) as a function of the astigmatism level and type. A total of 102 right eyes were included in this study. Refractive astigmatism and corneal astigmatism measured with Scheimpflug technology were retrieved from the preoperative visit and the 3-month follow-up visit. Patients were split into three groups according to the preoperative refractive astigmatism (0.50, 0.75 to 1.25, and 1.50 diopters [D] or greater) and the effectiveness among each group was evaluated according to the with-the-rule (WTR), against-the-rule (ATR), and oblique classifications. The standard Alpins method was used for the analysis. Resultant astigmatism was not associated with its preoperative classification when the total sample was considered, but a significant association emerged between the presence of resultant astigmatism and its preoperative classification in the 1.50 D or greater group. The magnitude of error was significantly lower in the WTR (median: −0.30 D) than in the oblique and ATR astigmatism groups, resulting in a coefficient of adjustment of 1.13 for WTR astigmatism of 1.50 D or greater but not for the other types. Astigmatism correction with SMILE is predictable for astigmatism lower than 1.50 D without the need to apply a correction. However, higher undercorrection is present in WTR astigmatism of 1.50 D or greater. Some patients who have SMILE may have a resultant refractive error, induced astigmatism, or regression.10,11 If their resultant refractive error is significant enough, these patients may seek further refractive correction or enhancement. Re-treatment rates after SMILE have not been extensively reported, but Reinstein et al.12 reported a 4% enhancement rate after low myopic treatment (spherical equivalent [SE] up to −3.50 diopters [D] and cylinder up to 1.50 D). Fernández et al.6 found significant undercorrection cases within a high myopia group (−5.00 to −7.00 D), whereas the low and medium myopia groups remained close to emmetropia. Recchioni et al.13 found a non-negligible postoperative SE in 18% of their patients at the 3-month follow-up visit (preoperative SE: −10.88 to −1.25 D, mean: −5.61 D). Several studies have determined the preoperative factors that could affect the enhancement after SMILE: age,14,15 manifest refractive SE,14–16 sphere,15 cylinder,3 and cap thickness.17 Recently, it has been also suggested that the effectiveness might depend on the astigmatism type,18–20 but as far as we know there is no peer reviewed publication to date that evaluates the influence of astigmatism classification and degree in the effectiveness of the procedure. The main aim of this study was to evaluate the effectiveness of SMILE according to the astigmatism level and type. This was a retrospective observational study that included all SMILE surgeries performed between January and December 2016 at our eye clinic (IOA Madrid Innova Ocular, Spain) by two experienced SMILE surgeons. Informed consent and permission to use their data for analysis and publication were obtained from each patient prior to surgery as part of our routine pre-operative protocol. The study was conducted in accordance with the tenets of the Declaration of Helsinki. All patients referred to our facilities for corneal refractive surgery underwent a preoperative examination that included manifest refraction, tonometry, pupillometry (OPD III Scan; NIDEK Co. Ltd., Gamagori, Japan), Pentacam HR corneal tomography (Oculus Optikgeräte GmbH, Wetzlar, Germany), biomicroscopy, and fundus examination. The postoperative manifest refraction and Pentacam HR corneal tomography were conducted during the 3-month follow-up visit. A VisuMax 500-kHz femtosecond laser (Carl Zeiss Meditec, Jena, Germany) was used for the SMILE procedure. Surgery was performed bilaterally and under topical anesthesia by instilling two drops of 0.4% oxybuprocaine 5 minutes and 1 minute before surgery initiation. As part of the preoperative patient preparation process, two marks were made at the limbus on the horizontal axis (0° to 180°) at the 9- and 3-o'clock positions, using a fine-tipped gentian-violet marker (Devon Skin Marker, Fine Tip 151; Devon Medical Products, King of Prussia, PA) under slit-lamp observation. The marks' positioning was confirmed by taking a picture of the patient, who was standing 2.5 m from a camera that was held in place with a clamping system that ensured a correct horizontal position. The optical zooming functionality allowed us to simultaneously photograph both eyes. The image was then exported to a computer and analyzed with Goniotrans ( http://www.goniotrans.com), a free software program that allows precise angle measurements. This way we were able to measure on the photograph the angle between the line going through both limbus marks and the horizontal line that transects the corneal reflex. This gives the exact position of the marks and their angular difference with respect to the “real” 0° to 180° line. Next, with the patient lying down, corneal marks were made along this real 0° to 180° line using a Mendez ring, taking as reference the photograph that showed the precise position of the marks that had been previously made in the limbus. These corneal marks need to be made 2 mm from the limbus, so that they can still be observed under the microscope once docking has been performed. Due to the cyclotorsion that occurs when patients are lying down, the real 0° to 180° line is not usually parallel to the reticle seen in the microscope's right viewfinder. In that case, the sucking cone should be manually rotated to match the corneal marks (the ones along the 0° to 180° line) with the reticle. Once appropriate centration had been achieved, suction was applied to the contact glass. As for the laser settings, we used a laser cut energy index of 25 (corresponding to approximately 125 mJ) and a spot spacing of 4.5 µm. Lenticule diameter (optical zone) ranged between 6.5 and 7.2 mm, whereas cap diameter was 7.3 mm and cap thickness was 120 µm. A side-cut incision (mean: 2.5 mm; range: 2 to 5 mm) was created at 135°. Immediately after surgery, the patient received 0.5% moxifloxacin (Vigamox; Alcon Laboratories, Inc., Fort Worth, TX) and 1% prednisolone acetate (Pred Forte; Allergan, Inc., Irvine, CA) eye drops. In addition, dexamethasone and ofloxacin (Exocin; Allergan, Inc.) were administered four times daily for 3 days and dexamethasone eye drops were used three times daily from the fourth day to the end of the second week and two times daily during the third week postoperatively. Non-parametric tests and median with interquartile range (IQR) for central tendency and dispersion were used due to the data being non-normally distributed, as emerged from the Kolmogorov–Smirnov test. A positive conversion of the cylinder to the corneal plane was performed before conducting the vector analysis. Astigmatism was classified according to the cylinder's axis orientation using positive notation (with-the-rule [WTR]: 90° ± 29°; against-the-rule [ATR]: either 180° to 151° or 0° to 29°; and oblique: 30° to 60° or 120° to 150°) because this classification matches the standard plots.21 Three groups were also created according to the 33rd percentile astigmatism magnitude (0.50, 0.75 to 1.25 D, and 1.50 D or greater). The chi-square test for proportions was used to detect any statistically significant association between nominal variables; however, for the cases in which all expected cell frequencies were not greater than 5, Fisher's exact test was used instead. The Kruskal–Wallis test was selected to evaluate the differences between WTR, ATR, and oblique for each level of astigmatism. The standards for reporting astigmatism values and outcomes21 were followed, both in terms of the terminology used in the current study and for astigmatism analysis by the Alpins method.22 All figures and vector computations were performed using the Refractive Analysis toolbox23 for MATLAB (R2009; MathWorks, Natick, MA). Data analysis was carried out using the IBM SPSS for Windows statistical software (version 20.0; SPSS, Inc., Chicago, IL); for all statistical tests that we used, we first checked that their corresponding requirements for them to be a valid choice were met. The study included 102 right eyes that had SMILE. There were 58 men and 44 women with a mean age of 31.63 ± 6.10 years (range: 23 to 48 years). Table 1 shows the frequency distribution for preoperative astigmatism type and the median value of both spherical and cylindrical refractive errors within each subgroup. No statistically significant association emerged between astigmatism magnitude and type of astigmatism (P = .56). The resulting postoperative astigmatism was 0.50 D or less for 93% of the eyes and 1.00 D or less for 100% (Figure 1A). Target induced astigmatism (TIA) accounted for 95% of the surgically induced astigmatism (SIA) variation and a linear undercorrection was obtained with its increment, slope 0.92 (Figure 1B). The refractive angle of error was greater than 15° in 4.9% of the eyes with no particular tendency for counterclockwise or clockwise errors (Figure 1C). However, the anterior cornea angle of error was greater than 15° in 28.5% of the cases with a clear tendency of counterclockwise SIA from the TIA (Figure 1D). Furthermore, seven extreme outliers (angle of error ≥ 50°) were identified in the anterior cornea angle of error (Figure 1D). The mean preoperative corneal astigmatism of the anterior cornea was 0.66 ± 0.44 D for these eyes versus 1.17 ± 0.77 D for the remaining 95 eyes (z = −1.79, P = .07). (A) Histogram of preoperative and postoperative astigmatism, (B) linear regression for the prediction of surgically induced astigmatism vector (SIA) by means of the target induced astigmatism vector (TIA), (C) angle of error histogram on which the negative values indicate that the refractive SIA is clockwise to the TIA and positive values indicate that the SIA is counterclockwise to the TIA, and (D) angle of error histogram for the anterior cornea. 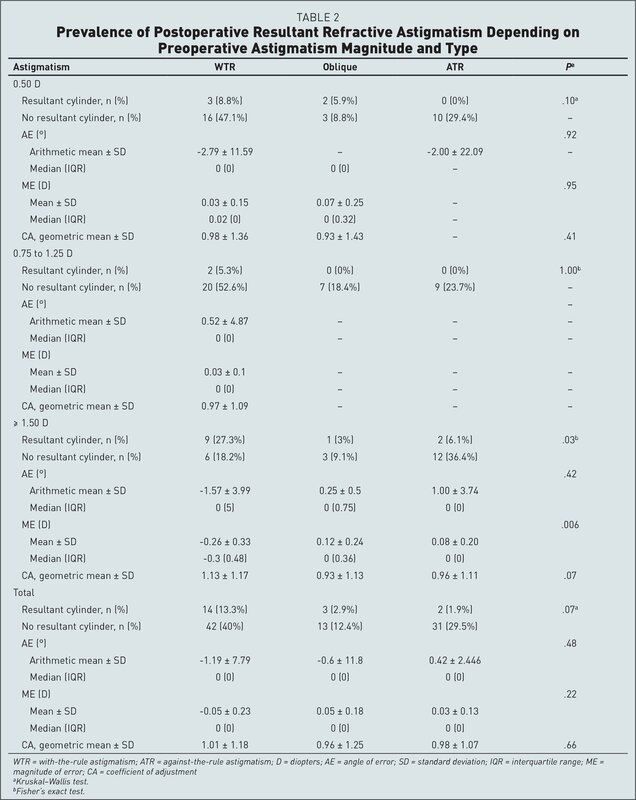 The presence of resultant astigmatism was not linked with preoperative astigmatism type when the total patient population was considered, but for the group having astigmatism of 1.50 D or greater, there was a significant association between the presence of resultant astigmatism and preoperative astigmatism type (Table 2). Particularly for the astigmatism of 1.50 D or greater group, the magnitude of error was significantly more negative in the WTR group (median = −0.30 D), resulting in a coefficient of adjustment equal to 1.13, which suggests a required overcorrection of 13% in this group. However, the coefficient of adjustment was not significantly different among groups (P = .07). Figure 2 shows the standard plots for vector analysis. The arithmetic mean of the anterior corneal SIA was underestimated in comparison to the refractive mean SIA. However, the vector mean was equal in magnitude at 0.22 D. The posterior corneal astigmatism was not changed after surgery (Figure 2). The difference vector (DV) resulted in an arithmetic mean of 0.11 D and vector mean of 0.05 @ 178° for the total sample. The magnitude of error, angle of error, and coefficient of adjustment for each of the subgroups are shown in Table 2. Standard single plots for reporting the target induced astigmatism vector (top left), the refractive surgically induced astigmatism vector (top right), the refractive difference vector (middle left), and the refractive correction index (middle right). Corneal surgically induced astigmatism is also represented for anterior cornea (bottom left) and posterior cornea (bottom right). For these variables, only the magnitude of error showed significant differences between astigmatism type groups in the 1.50 D or greater group. Figure 3 shows a decomposition of orthogonal components of the magnitude of error and TIA, with a higher number of dots for positive TIAx and positive MEx, which indicates an undercorrection, especially for those cases for which TIAx was higher (higher WTR astigmatism). Orthogonal decomposition of the magnitude of error (ME) and the target induced astigmatism (TIA). (A) Positive values in the horizontal axis indicates preoperative with-the-rule astigmatism and negative preoperative against-the-rule astigmatism. 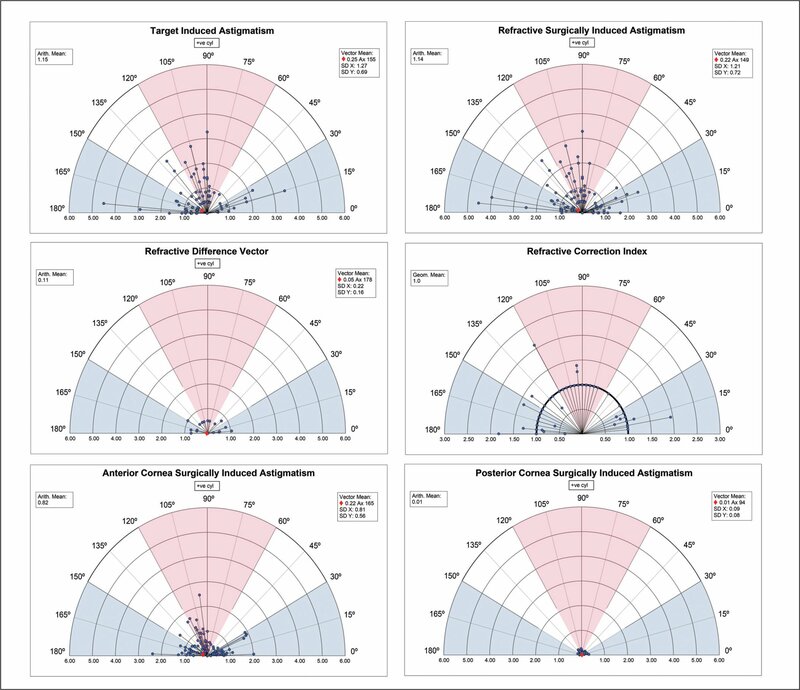 Positive values in the vertical axis indicates astigmatism undercorrection and negative values overcorrection. (B) Oblique components for which positive values in the horizontal axis indicate 45° and negative values indicate 135°. Astigmatism correction with SMILE was evaluated as a function of the astigmatism level and type. We found that, in the context of SMILE refractive surgery, astigmatism correction was predictable for astigmatism levels of less than 1.50 D; in these cases, no correction seemed to be required by the surgeon. However, undercorrections were found for higher astigmatism cases of specific types. Several studies have reported astigmatism outcomes in SMILE. Ivarsen and Hjortdal24 observed a significant undercorrection and increased errors when attempting higher degrees of astigmatic correction. In their low astigmatism group (mean attempted cylinder correction 1.04 ± 0.57 D, range: 0.75 to 2.25 D), 77% of the eyes were within ±0.50 D and 95% were within ±1.00 D of the intended correction of spherical equivalent 3 months postoperatively. In their high astigmatism group (mean attempted cylinder correction: 2.61 ± 0.76, range: −2.50 to −5.75 D), a total of 77% of the eyes were within ±0.50 D of the intended correction and 97% were within ±1.00 D. The under-correction was predicted by 13% per diopter of low myopic astigmatism and was 16% per diopter in high astigmatism. Pedersen et al.18 found an astigmatic undercorrection of approximately 11% (mean preoperative astigmatism: 1.81 ± 1.00 D; range: 0.75 to 4.00 D). Our study is partly in agreement with the previous ones, but only in the case of WTR astigmatism 1.50 D or greater, for which it is required a 13% of overcorrection according to the coefficient of adjustment. On the other hand, Qian et al.25 and Zhang et al.26 found an overcorrection for low astigmatism levels (≤ 1.00 D). Our results are not in agreement with these two studies because we found good outcomes for astigmatism levels up to 1.25 D. For higher astigmatism cases, their results coincide with ours: undercorrection tends to increase with TIA. Kobashi et al.27 also reported astigmatism undercorrection (−0.33 ± 0.45 D) in a patient sample whose astigmatism ranged from −1.00 to −2.75 D. These outcomes were similar to those recently reported by Khalifa et al.28 (mean magnitude error −0.20 ± 0.35 D), although the latter included astigmatism levels up to −3.25 D. Despite using non-conventional terminology,29 Kunert et al.30 found a slight astigmatic undercorrection (approximately 10%) in a sample of 113 patients with myopic astigmatism (cylinder range: −6.00 to −0.25 D). As for our study, the undercorrections were 0.37 ± 0.35 D for the WTR, 0.13 ± 0.25 D for the oblique, and 0.11 ± 0.29 D for the ATR groups for astigmatism greater than 1.50 D. The other studies do not break down undercorrection values based on astigmatism type, but our results could be comparable to their average values. It is important to remark that, according our results, higher undercorrections would be obtained for higher WTR astigmatism cases. Treating astigmatism with the SMILE technique seems to yield predictable outcomes, but with a tendency toward slight undercorrection in high WTR astigmatism cases. Future studies comprising a larger sample size would be required to confirm our findings and to develop a valid nomogram including the preoperative astigmatism classification. Ivarsen A, Hjortdal J. With- or against-the-rule astigmatism, does it matter in SMILE surgery? Presented at the XXXV Congress of the European Society of Cataract and Refractive Surgery. ; October 7–11, 2017. ; Lisbon, Portugal. .
Ganesh S, Brar S, Binesh Tyagi. Outcomes of astigmatism correction in with-the-rule and against-the-rule astigmatism in eyes having small-incision lenticule extraction for myopic astigmatism. Presented at the American Society of Cataract and Refractive Surgery Annual Meeting. ; April 13–17, 2018. ; Washington, DC. .
Rodríguez-Vallejo M. Refractive Analysis v.1.0.0: a Matlab tool-box for the analysis of refractive results in anterior segment surgery. 2017. http://test-eye.com/index.php/en/refractive-analysis. Accessed March 24, 2018. From IOA Madrid Innova Ocular, Madrid, Spain (RP-I, AM, NG, FP); the Department of Ophthalmology (Qvision), Vithas Virgen del Mar Hospital, Almería, Spain (MR-V, JM, JF); and the Department of Ophthalmology, Torrecárdenas Hospital Complex, Almería, Spain (JF).